A visit to Dubai provides the opportunity to see the city from some of the tallest structures in the world. Make time to stop in during the day or at night to see the city skyline from a unique perspective. While traveling to Dubai is expensive, it can be worth the trip to see these amazing buildings constructed by man and defying the elements of nature. Some of these buildings offer great shopping or eating experiences as well, allowing you to maximize your visit to striking architectural feats of wonder. 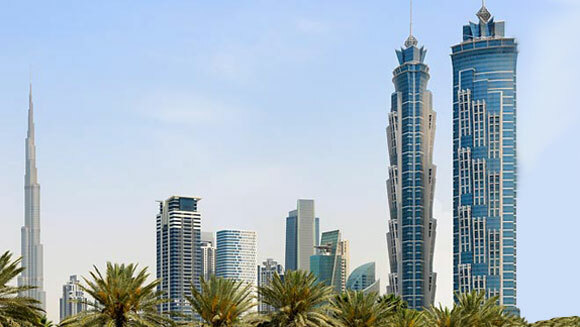 Below are 10 of the tallest structures in the world, all conveniently located in Dubai. This building is the tallest building in the world, with a total height of 829.8 meters. The height is measured from the pedestrian entrance to the highest floor, which continually sees foot traffic in the building. Maintenance areas are not included in the height measurement. The building has an observation deck on the 124th floor, allowing visitors to enjoy the view of Dubai’s skyline. The desert, the ocean, and the city skyline combine for a gorgeous view from the heights of this skyscraper. The occupied height for this building is 370.9 meters, while the architectural height is 425 meters. This building has 28 elevators and the crown, when lit at night, can be seen from the Dubai airport. This structure will serve as a home to some of the residents of Dubai, as it houses serviced apartments and will also be the location of the first Hard Rock Hotel in the Middle East. This 414-meter structure made the Guinness Book of World Records in 2012 as the tallest residential building in the world. The tower houses 763 luxury apartments and eight retail stores. It has eight basements, one ground floor and 100 levels above ground. 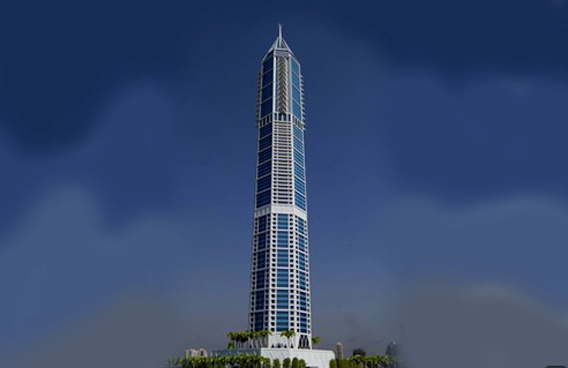 The Almas Tower is located in the Jumeirah Lake Towers Free Zone. It houses the Dubai Diamond Exchange. It is also home to an amazing architectural feat of a two-story podium for the exchange, made of eight triangles that extend out from the core of the building. This structure is 360 meters, with 279.3 meters occupied. The building has 68 floors above the ground and five floors below the ground. Moreover, the tower has 35 elevators and is asymmetrical, with the southern portion being 12 stories taller than the northern part. The former also sports a spire that is 81 meters tall. The JW Marriott Marquis Dubai Tower 2 is the world’s tallest hotel. 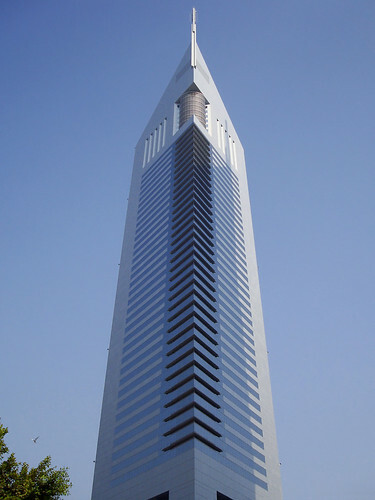 This building is 355.4 meters tall, with an occupied height of 298.1 meters. The structure has 82 floors above the ground and only two floors below the ground. The tower’s design is inspired by the date tree. It has 66 guest floors, eight service levels, and six intermediate levels. This hotel is also home to 18 restaurants and bars, as well as a business center complete with conference halls and meeting rooms. Think that’s all? Think again. There is still a banquet hall, stores, a swimming pool, and a gymnasium. al height of 352 meters and an occupied height of 300.1 meters. The tower is home to six retail locations, 676 residential apartments and numerous penthouses of different sizes. The rooftop is home to palm trees, a swimming pool, a sunbathing area, and a Jacuzzi. The Rose Rayhaan by Rotana is recognized by the Guinness Book of World Records as the world’s second largest hotel, soaring 333 meters into the air. This hotel is home to 462 luxurious rooms and suites on 72 stories. Rose Rayhaan has three food and beverage outlets, as well as a conference area that takes up two floors and includes seven meeting rooms. This building stands at an architectural height of 354.6 meters and has an occupied height of 241.4 meters. 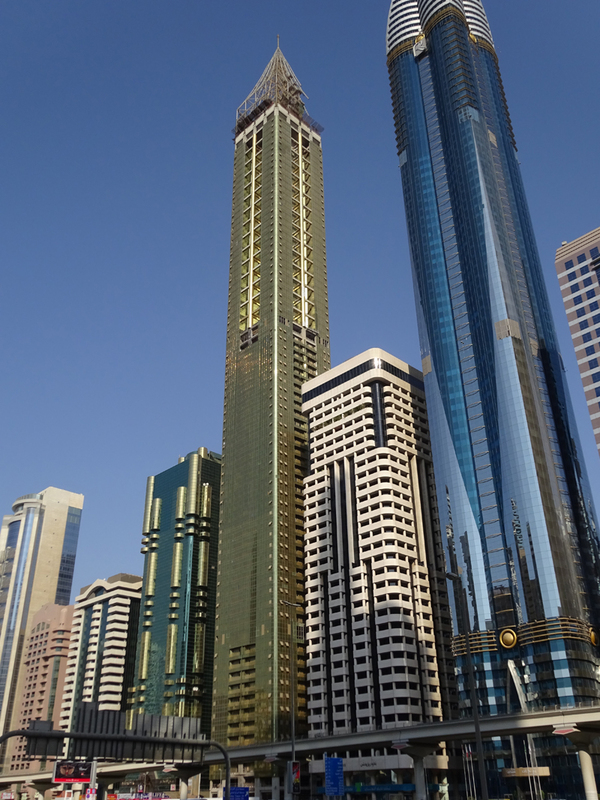 This was one of the first skyscrapers to be built along Sheikh Zayed Road. It is a twin skyscraper, built on a three-storey terraced podium. The podium houses a retail mall, restaurants, and cafes. The building itself houses commercial offices, many column-free thanks to the steel and concrete hybrid construction of the tower itself. The Tower has an architectural height of 342 meters. This building is a residential tower and is centrally located in the financial district of Dubai, built on Sheikh Zayed Road. The building is rectangular, with gold elements at the corners and numerous windows on each level to let the light into the residences. The gold elements combine in a pyramidal crown structure on top of the tower. The Burj Al-Arab is recognized as the most luxurious hotel in the world. It is 321 meters tall, built in a sail-shaped silhouette and constructed on an island, so the view below is of the surrounding sea. This hotel offers an underwater aquarium restaurant and a helipad, as well as numerous Rolls Royce vehicles for the transport of the guests – definitely, a WOW factor! No wonder Burj Al-Arab earned the title with no questions.